Kids love playing with walkie-talkies. It’s a cool way to keep in touch with them when they’re playing out of your sight, or for them to keep up with their friends during games or playing pretend. Because there are so many options out there, we’ve put together this walkie talking buying guide to help you choose the set that’s perfect for your family! Let’s look at some of the things you need to know. Over! Range: This is how far the signal will stretch. This means that the handsets can be this far apart before you can no longer talk to the person on the other end. Choose the best distance for you! Pieces: The number of handsets that come with each set. 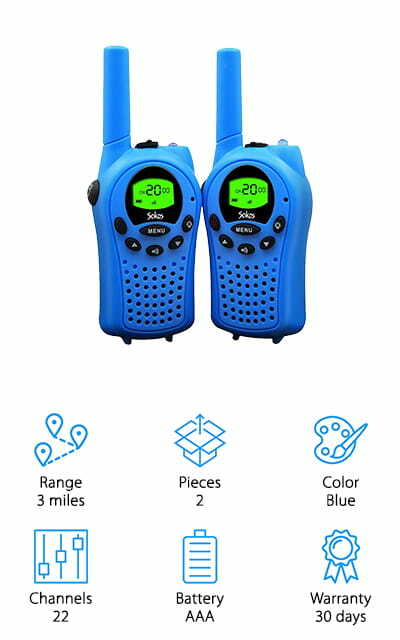 Usually, a set of walkie-talkies contains 2 different sets and you can buy additional ones that will work together as long as they’re on the same channel. Color: This is the color of the handset casing. Choose a bright color so your kid will be less likely to lose it, but also one that you know that they are going to love and want to play with! Channels: This is the number of frequencies available for the talkies to run on. They have to be set to the same channel, so a wider variety of channels means you might run into fewer interference problems. Battery: Some heavy-duty or professional adult walkie talkie sets use recharging lithium batteries, but for the most part kids’ versions use either AA or AAA batteries. Keep extras on hand for the best experience and replace them often. Warranty: You want a working purchase, and so do the makers of these products. They are covered for a certain amount of time under a warranty to prevent this from happening. You can get a refund if there’s a problem. Now we can get to the walkie talkie reviews! Your kids are sure to love playing with any of the sets on our list, but if you’re in a hurry, our top pick and budget pick are the best! We’ve carefully researched and reviewed all of the products on the list to bring you only the best choices for these toys. Rest assured that these are the best of the best available right now! Roger that! Our pick for the best walkie-talkies for sale are these Little Pretender handsets. They are bright blue, so they will be easy to find in the grass or dirt. There are three channels that you can set them to so they can communicate with each other, and you can set these on the bright LCD display screen. There’s as call alert function for when you need to tell them to come home, as well as a belt clip for hands-free play! There’s even a built-in flashlight if they should ever need one! These handsets have clear voice technology so you will always be able to hear and be heard over the air! They are durable, lightweight, and just small enough to fit comfortably in your child’s hand. They are easy and fun to use, with a kid-friendly interface that will make you all happy! We love that they are wear and tear resistant as well! 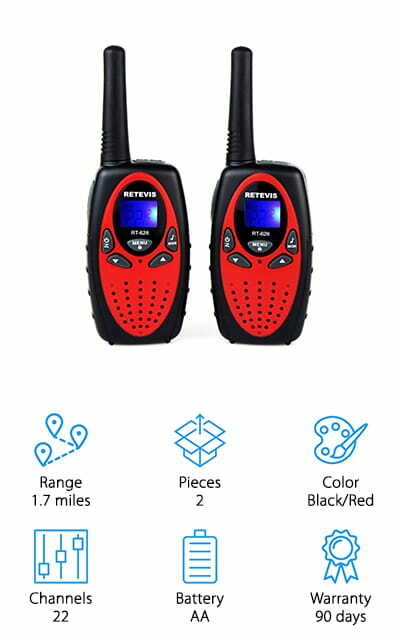 These Retevis Walkie-Talkies have a range of up to 1.7 miles for backyard or neighborhood use! They are incredibly light and easy to use. The included belt clip can even be assembled by the children themselves! There are multiple communication functions, including one that allows you to talk one-on-one and another that will allow you to talk to multiple handsets if you purchase multiple packs. It’s super useful if you have more than one kid! The talk button is easy to find, easy to press, and turns on the built-in microphone. There is no always-on feature so your child can feel secure in their privacy while also easing your mind. These are the best cheap walkie-talkies that we found, and an amazing value for the price! Your child will get hours of fun out of these devices, and we are sure that you will love the open communication as well for your kids without cell phones! 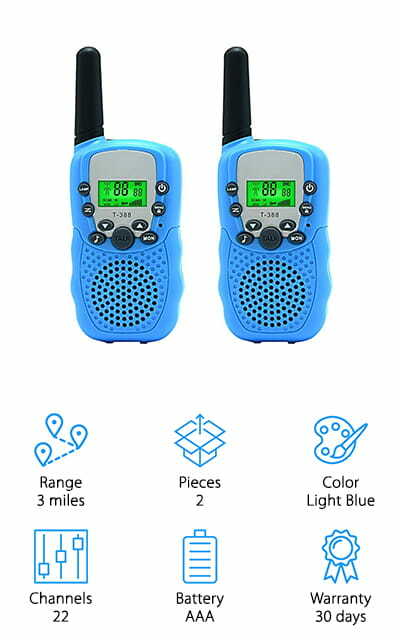 Aphse makes some of the top rated walkie-talkies for kids, and these light blue walkie-talkies are excellent! They have a small, lightweight design that is easy for your kid to use and carry about. They are durable enough to withstand all of your little ones’ adventures! The grips are ergonomically designed so they are easier to hold onto while playing, and there is an easy-attach belt clip as well. There are an amazing 22 channels available for these walkie-talkies! That is pretty amazing! It has a function that works to mute background noise so the sound is always clear - you can always hear the person you’re talking to. The range is an incredible 3 miles as well! Let your child roam further than before and keep your peace of mind as well! 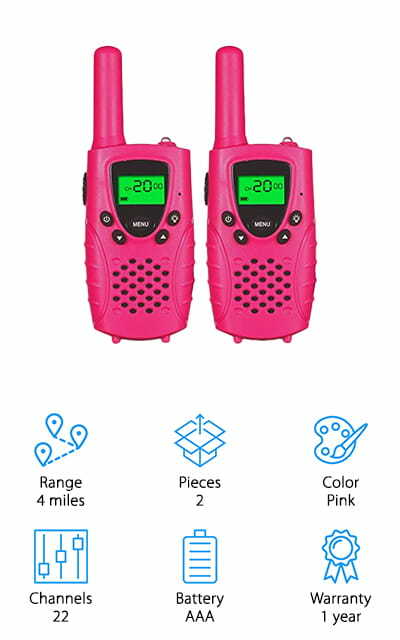 If your child likes to explore or play pretend outside, these walkie-talkies will make the experience so much cooler! These Sokos walkie-talkies are absolutely loaded with functions and features to make your kids’ playtime enjoyable! It mutes the background noise when they’re talking so you will always be able to hear them, as well as having a system that automatically scans for the channel they need to connect to. There’s a built-in flashlight in case your child needs one on their adventures. The batteries run the walkie talkie handsets for 3.5 hours of continuous use, or 9 hours on standby. Surely you’ll get a lot of use out of one battery change. These are extremely easy to use with the push-to-talk operation, as well as beep signals that can alert your child that you need to speak with them. You can even lock the channel so they don’t break into other signals! Sokos makes some of the best walkie-talkies for kids with this product! This FAYGOO Kids set has long-range walkie-talkies for kids at an astounding 4-mile range. That’s pretty amazing! These handsets are a vivid pink on the outside, perfect for girls as well. They’re very easy to use, portable and lightweight. Take it camping with you and let your child explore the area! The LCD display is backlit for easy viewing, as well as 10 different ring tones if you need to reach your child. There’s an earpiece connection for hands-free exploring and fun! These sets are extremely durable and won’t break as easily as some other models. What’s more, there are 38 different privacy codes so you can set up your own channels that no one else can get into. That’s a great feature for parents! In addition, there are 22 non-private channels you can use as well. All the background noise will be cut off so you can hear your child and only your child. 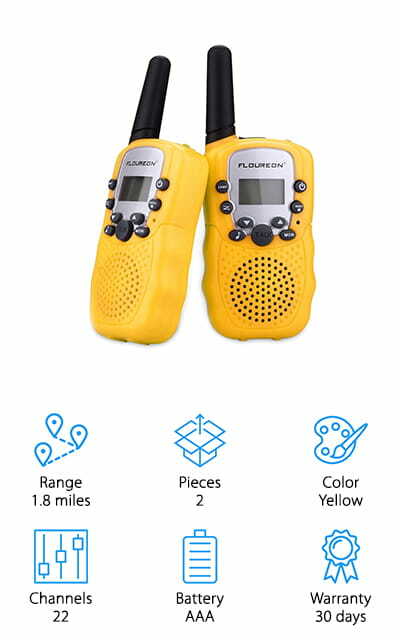 These Floureon Walkie-Talkies are pretty amazing! They’re bright yellow, so they can easily be found in most outdoor environments. The range is 1.8 miles, so it’s perfect if you want to keep your kids a little closer. It can be used with a headset for hands-free playing and explore as well. There are 22 different channels it can use, so you’re sure to find one that isn’t already being used. The sound is loud and clear, and you don’t even have to press the push-to-talk button - these handsets can double as a baby monitor if you’d like to use them that way! We love the built-in flashlights that come with these cases, to help your child explore. The display is backlit so you can see all the settings as well as the low-battery alert and call alert. The sound is so clear you’ll be able to hear your child even in crowded areas! 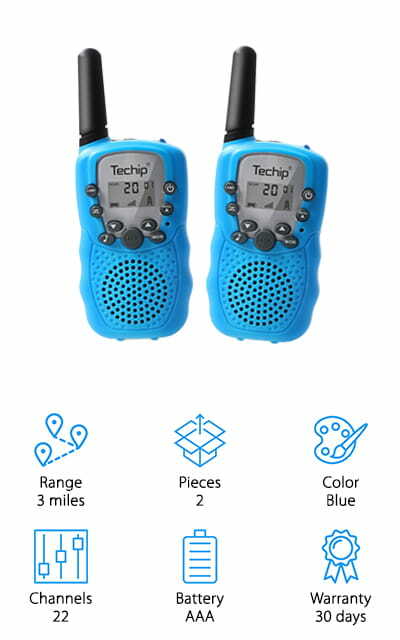 These blue Techeip pieces are good walkie-talkies for kids! They are simple to use and have a basic push-to-talk button that will allow you to talk back and forth with your child. There is also a voice-activated system that transmits messages automatically, which we think is pretty cool. These radios are so lightweight and portable that your child will love to carry them around! Your kids are only a few AAA batteries away from having fun exploring and wandering in their own backyard. You can lock them to a certain channel so they can’t accidentally change it. The material is durable enough that they will bring your family lots of fun for years to come! The volume level is adjustable. What’s even better is that you can use a headset for them! Next time you go on a family outing, take these radios with you so you can easily keep track of your kids! 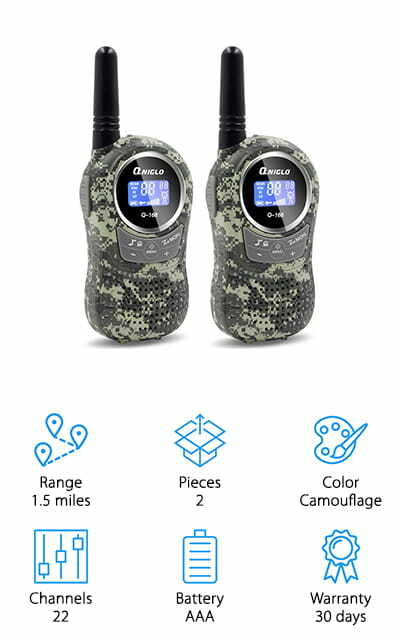 These QNIGLO Walkie-Talkies are super cool because they come in camouflage! Your little explorer will love these! There are 22 channels you can use to keep your family connected. 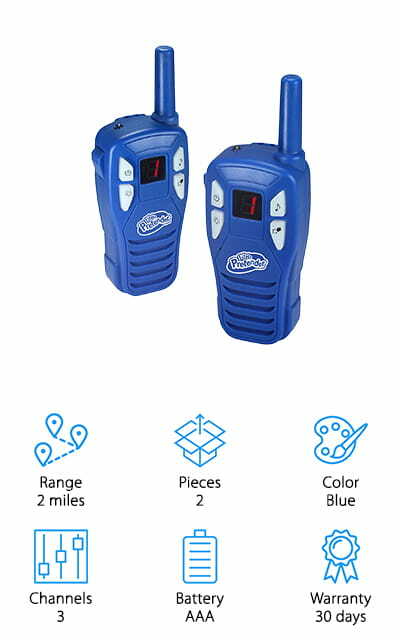 You can buy multiple sets and connect them all together, so all of your kids and family members can have a walkie talkie to check up on each other. The sound is super smooth, and the filtering system eliminates most background noise so you can clearly hear each other. They are small, compact enough to not get in the way of their play time! It’s great to use these for outdoor activities, and these radios won’t lose signal like cell phones will! Adjust the volume to be able to hear your kids no matter what else you’re doing around the house. 3 AAA batteries will get you 3.5 hours of continuous use. They are some of the best walkie-talkies for kids! Keep your family connected! E-wor’s Walkie Talkie set has an amazing 4-mile range! That’s incredibly impressive and will let your older child wander a little further. Both of you are happy! They come in cool camouflage, so they’re stylish as well. It functions on a push-to-talk button, so you won’t hear every little aspect of your child’s playtime or exploring. There are 22 channels that you can use to keep track of your kids, and you’re able to lock the units to a specific channel so they don’t accidentally change it. They are durable as well as lightweight, easy to carry and they don’t even have to be carried! They also come with a belt clip so your kids can keep them close and still use their hands. By the way, they fit perfectly in your child’s hands! These will be your kids best walkie-talkies for years to come! You can even buy more than one set for more fun! Aikmi makes some of the best rated walkie-talkies for kids! 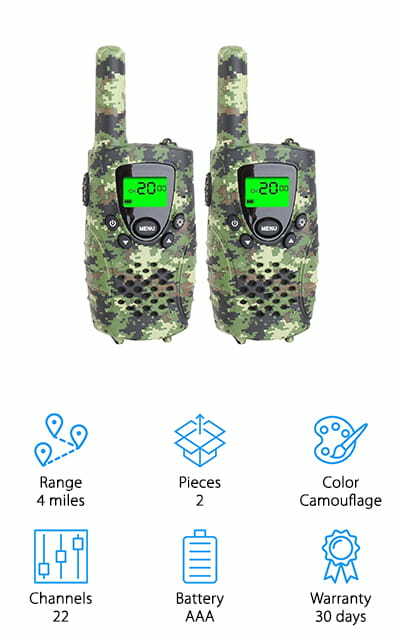 These particular radios come in camouflage blue, which is really cool and unique on our list. 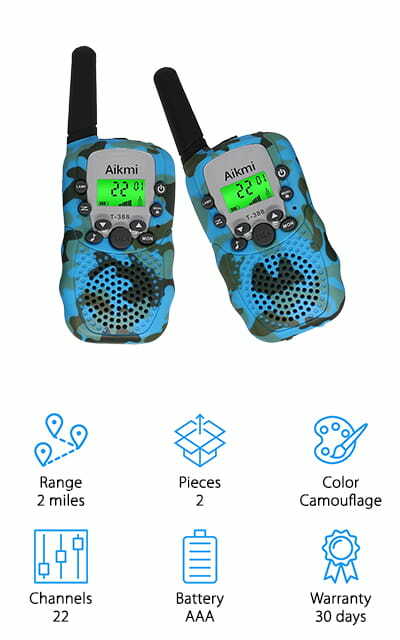 It’s a two-way radio that you can use for outdoor activities or just outside playtime in your neighborhood. They won’t lose service like cell phones will, so they’re perfect for places where there’s less signal. Your child and their friends can use them for pretend play! There are even private communication channels you can use with these radios so no one can break into your connection. It makes a great gift, and if they don’t love it? There’s a 100% money back guarantee. We are sure that your family will love them! It will ease your mind when your child is out playing to know that you have a sure way to get ahold of them. It’s even great for pretend play in the backyard. These walkie-talkies have so many uses!